Dr. Renato Pagano was born in Catania, Italy in 1938, and earned a Doctorate in Electrical Engineering at the University of Genoa, in Italy. He also did graduate work at the Rensselaer Polytechnic Institute in Troy, New York. In his professional life in industry, Renato had frequent occasions to travel abroad, to visit famous mineral localities and to meet other collectors, to see mines and minerals, and to establish interesting relationships with curators. Today the Pagano collection includes over 15,000 specimens, divided into a species collection (5300 different IMA species are represented) and an aesthetic collection. Renato is probably one of the leading experts on the heyday of sulfur mining in Italy and its postwar decline. A new mineral, paganoite, was named for Renato and Adriana in 2001. 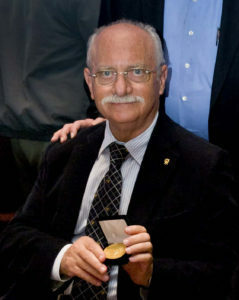 The authors of paganoite note that this was for “very competent mineralogists who have contributed significantly to the advancement of specimen mineralogy in Europe for over 25 years.” In 2013 Adriana and Renato were awarded the Pinch Medal by the Mineralogical Association of Canada, the seventh time the award was given. Dr. Federico Pezzotta will be presenting on behalf of Dr. Pagano. The sulfur deposits of Italy have been worked for hundreds of years, mainly for industrial use and also for the manufacturing of gunpowder during Europe’s wars. Fine crystallized specimens of sulfur, aragonite, celestine, and other minerals have been recovered from most of the mines. The culture of appreciation of the beauty of natural crystals was also a factor in the preservation of outstanding specimens. These specimens remain the standard for superb minerals to this day. Renato will share stories of his adventures to the mines since 1960, and the amazing (now mostly vanished) history of the hard lives of the miners here over the centuries.